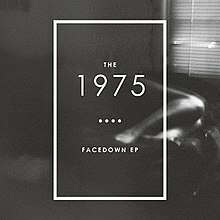 Facedown is the debut extended play by English rock band the 1975 released on 6 August 2012 through Dirty Hit. It is the debut of four EPs released before the band's self-titled debut. The release of the EP in August 2012 saw the band's first UK airplay on national radio with lead track "The City", which featured as part of a BBC Introducing show with Huw Stephens on BBC Radio 1. On 19 May 2013, a re-recorded version of "The City" was released as a single from the band's fourth EP, titled IV. The song peaked at number 30 on the UK Singles Chart and number 27 on the Scottish Singles Chart. The EP's sound was noted as "reverb-soaked guitars and emotive vocals with a distinct twang." All lyrics written by Matthew Healy; all music composed by The 1975. ^ "iTunes - Music - Facedown - EP by The 1975". iTunes. Retrieved 29 June 2013. ^ Faughey, Darragh (11 December 2012). "The 1975 - Interview". GoldenPlec. Retrieved 23 December 2012.